Guatemala food is sooooo cheap! | Travel Smart! Guatemala food is sooooo cheap! Home or traveling – Buy local!! A big box of fresh veggies from Jeronimo’s garden costs only 3$!! In Guatemala, you can buy lots of delicious fresh fruits and veggies for very cheap. This morning I went to San Pedro’ market and bought a water melon, a papaya, a pinapple, 10 bananas, 5 advocadoes for 50 Quétzales (8$). 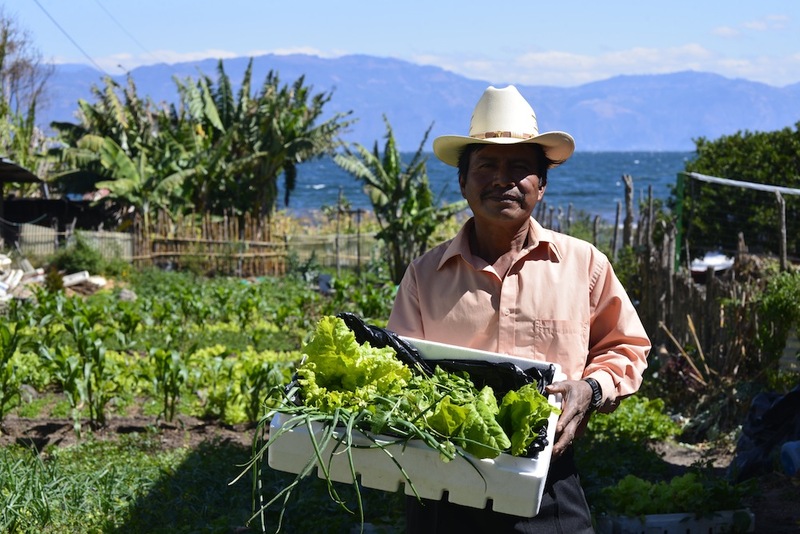 Each 3 days, I also stop by Jeronimo’s garden and buy him this box of veggies, freshly cut for 20 Quétzales (3$). He works from 4 am to 7 pm each day for its garden. Jeronimo’s garden is located just outside Mikaso hotel in San Pedro La Laguna. Home or traveling, realize the importance of buying local grown food rather then buying packaged food. You’ll save on money, help local economy, eat fresh and then won’t encourage the corporations that contaminate our planet with their processed food.